We loved our stay. A little disappointed the pictures showed the rooms looking directly out to the lake and we did not have a lake view. Great place for a long weekend. Amenties include microwave, fridge, Mini sink, Kitchen cabinet, Coffee pot so you can stay in and somewhat cook. Huge beautiful bathtub with jets. I want one of these in my home. It's at least 5 feet long. Need to get an Ice machine on site and it would be a total 5 Star. Water is right down the walk way. Perfect. Would definitely stay again. We had a great time! I rented two rooms one for my daughter and her boyfriend and one for myself and husband. We have stayed previously and loved the location and room. The only problem this time is a pontoon boat was not available (we did rent one from the marina) because they were booked full, also it would be nice to have more than one fire pit the same people monopolized it the whole weekend. Other than that it was great. 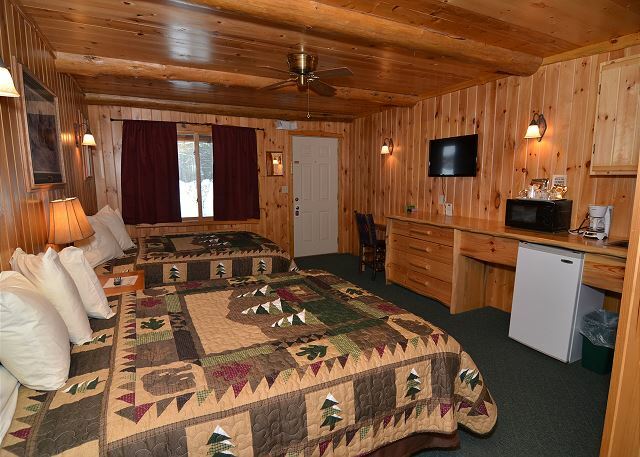 We are also renting a cabin from Grand Pines this year and look forward to staying again soon. The people at Grand Pines are always very helpful and polite. They make me excited to start my vacation. We enjoyed the Angler for fish fry on Friday night and Coops for pizza on Saturday. Both very good. We had plans to eat at the motel but got rained out. We would recommend this site for anyone looking for a great escape. Lake included!!! Great fishing! 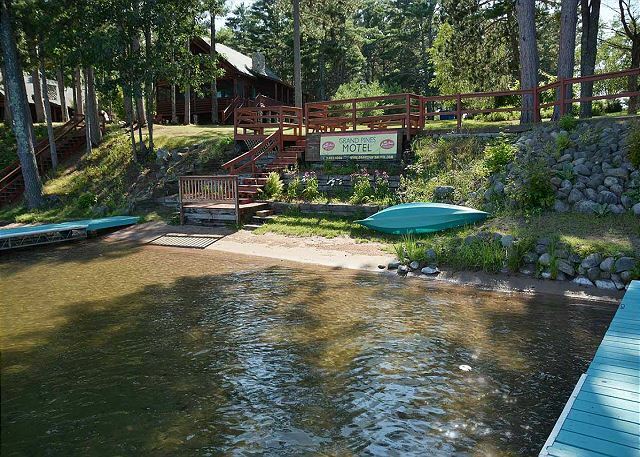 From the friendly staff to the knotty pine decor, and from the nightly fire-pit gatherings to the great kayak rentals -- Grand Pines Motel on Little Round Lake was a great home-base for our family vacation. We called for this room last minute and had no problems. Room was clean and comfortable. My only issue was at 10 am gals knocking on door to clean. I didn’t realize it was 10am check out. Would have liked to have enjoyed a coffee by lake😕oh well next time! This is a great place to stay. The staff was very kind and make you feel at home. they were also very helpful with information about what to do in the area. Everything was really nice. 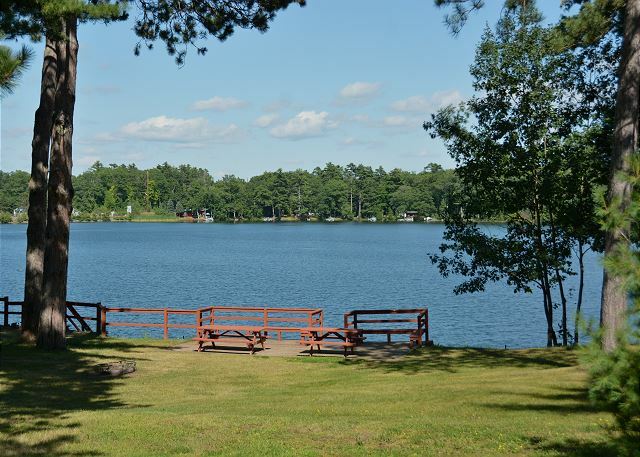 We rode the Chequamegon 40 and Grand Pines was a perfect location for us. Perfect. It's a great setting, the rooms are clean and large and the managers are helpful. This will be our third year staying here. the rooms are clean and a great location. We had a great stay once we found the motel. We had to ask at a gas station and a women who used to work for Grand Pines happened to be in the gas station and told us how to get there. We get to the motel and the door is locked and no one around to give us a key. I was in tears, our grandkids were upset, and it was cold and raining. We finally saw somebody walking and asked where the office was located. They said that they had sent us an email giving directions but either we didn't get it or we had already left on our trip.